These outstanding, all-metal hand-painted nose art panels are an ideal compliment your aviation artwork collections, adding a bit of history and nostalgia to your walls! 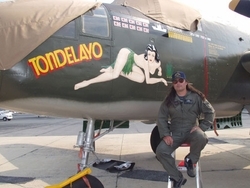 Artist Gary Velasco has painstakingly researched all available records of the art work, aircraft and units they were attached to in replicating each panel he creates. He tries to adhere to a high standard of quality without taking a lot of artist's liberties in his effort to re-create the best possible rendition of the original artwork as originally appearing on the aircraft. Gary does not employ weathering techniques to enhance his panels unless otherwise specified.